New Orleans is known as a party town thanks to the Mardi Gras festival that is known across the world for it’s street partying and rowdiness. Sports and partying go hand in hand, and New Orleans is also a great sports town with two big time professional teams in the Saints (NFL) and Pelicans (NBA). The Saints especially are the love of the city with the team bringing the Super Bowl home back in 2009. Whenever there is a successful NFL team located in the city you can be sure that sports betting is a major part of the culture. On this page I will answer the popular questions surrounding the legality of sports betting in New Orleans, give a couple online sportsbook recommendations and look at the offline betting options available in the city. 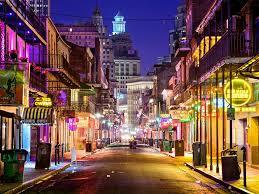 Is Sports Betting Legal in New Orleans? The easiest way to answer this question is in two parts…. Like most US States, sports betting is not regulated in Louisiana. This means it is not legal to run a gambling operation (sportsbook) within the State. That said, it is not illegal for residents of New Orleans to place bets with sportsbooks located and regulated outside of the state. Offshore sportsbooks, like the two I recommend below, are licensed and regulated outside of the United States. Because of this these sites are able to accept New Orleans residents without any issues, and they have become popular and trusted options for Americans from across the country looking to place wagers on sports. These are our two top rated betting sites for New Orleans residents. Both of these online sportsbooks are popular across the country and provide a trusted platform to place your bets. Check out either of the reviews above for a further breakdown of each site. At this time it is not possible to place sports bets at brick and mortar locations in the State of Louisiana. This may change in the future with other States, such as New Jersey, already joining Las Vegas as States that allow regulated sportsbooks in the state. The only place you can currently place sports wagers in Louisiana is at the racetrack. New Orleans is home to the popular Fair Grounds Race Course, which is located right downtown. Fairgrounds Race Course & Slots is located directly downtown in New Orleans, right across from the New Orleans Museum of Art. This is one of the top tracks in the United States and easily the best horse racing track in the region. The track was originally called the Louisiana Race Course and held races as far back as 1839, making it the second oldest horse racing site in the country. The biggest race of the year at the track is the Louisiana Derby, which is a popular preparation race for the Kentucky Derby. On top of wagering on the live races, you are able to bet on races from all of the top tracks across the country at Fair Grounds Race Course. If you aren’t able to head to the track to bet on the live races, you can also place bets on the Fair Grounds races at either Bovada or BetOnline. Both sportsbooks take bets on all of the races run at Fair Grounds throughout the year. ***I should note that sports betting is not offered at the racetrack.